Open the Facebook page in a new tab/window. Click on the invite friends to like page button present in the left pane. A list of about 50 friends will be displayed, scroll till the very end of the list in the pop-up to ensure all your friends are listed here in (The lazy ones can just press anywhere in the middle of the pop up and keep page down pressed endlessly till the time you reach the end). Open the console of your browser (here is a list of keyboard shortcuts if you are unaware of how to do this). 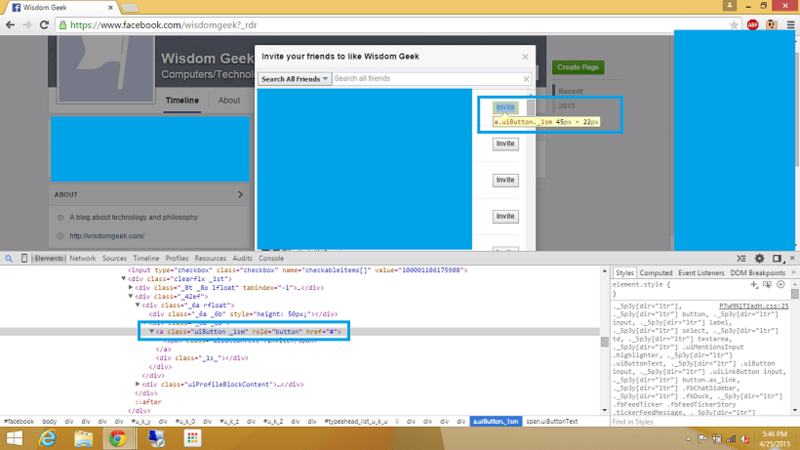 Once you press enter, the script will start clicking all invite buttons present on the page for you. All you need to do is sit back and relax. It might take a few minutes depending on the number of friends you have. document.getElementsByClassName searches the whole HTML page for elements that contain the parameter passed in and returns an array of objects that match it. You then simply are iterating over these in a for loop and clicking them programmatically. So the next time you try it, and if it returns ILLEGAL or unexpected token ILLEGAL or something else (doesn’t work in short), just right click and inspect element on a button. Check the class attached to the <a href=””> tag of the button and replace ‘_1sm’ with the ending instead. And if it still is ends in ‘_1sm’, just remove the quotes and type them in again. Many times the encoding of characters gets changed when copying quotes. That’s how you can mass invite Facebook friends to like a page. And if you have any troubles let us know in comments! 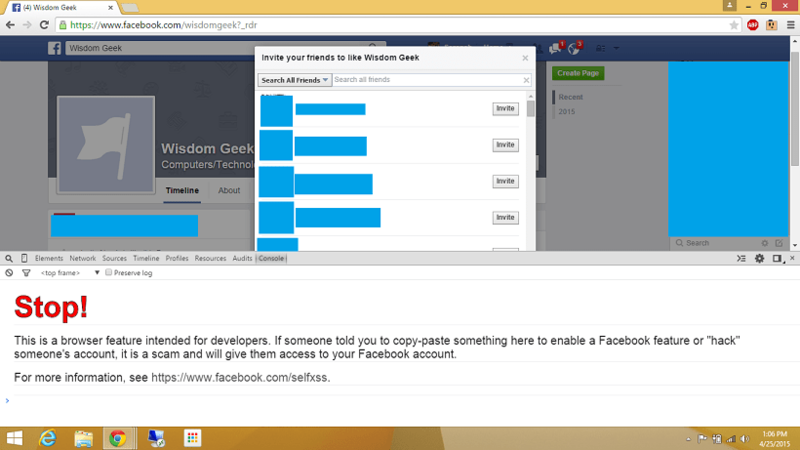 PS don’t forget to like the Facebook Page for WisdomGeek. Cheers!